I have a habit of keeping tons of images that I'll never do anything with. On my first pass after downloading the images from a trip, I'll delete anything that doesn't meet my standards for focus or sharpness. I'll mark images that have a particularly strong composition (flag with a "P" in Lightroom) to come back for another look, but I generally just let the normal images take up space on my disks and fill up my Lightroom catalogs. I basically make the argument that if it's sharp, perhaps I'll find a purpose for it later. I've really come to the realization though that there are tons of images I'll probably never look at again, and that I'll certainly never do anything with. So, I've started going through old folders and trimming out things that just don't meet a minimum level of compositional interest. It's kind of fun to re-experience old outings, and while my primary focus is cutting images, I've found a few diamonds in the rough that I had no idea were in there. This image of a semipalmated sandpiper and its reflection in the sand is one such example. I have no idea how this wasn't favorited when I took an initial pass through this folder, but I'm excited to find it again! 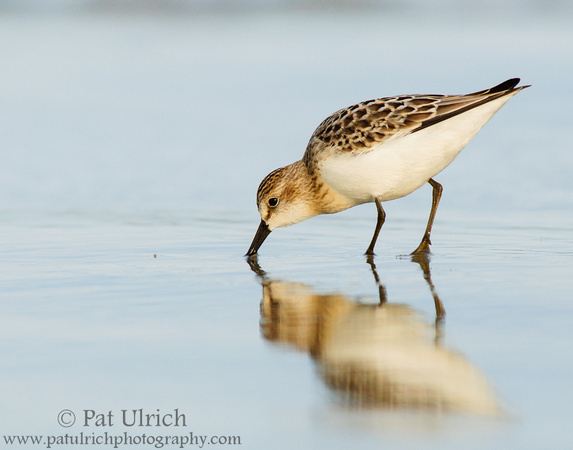 View my twenty favorite shorebird images in my Shorebirds Portfolio. Glad to see you're blogging again Pat. Great to see you back Pat, have kept your link hoping you'd return..... nice one. of course your back with a bang of a Sandpiper image. Another striking image from the archives Pat. I certainly need to buckle down and thin out all the saved items if only to free up some disk space!